CRICKET: Deservedly crowned C&C Marine league champions last Sunday (Sept 23), Patong White defeated both Kashmiri CC and Goan Panthers in a single day following an epic effort of 80 overs worth of cricket for the team that included playing a semi-final and Grand Final in sweltering conditions at the ACG. Having agreed to replay last weekend’s abandoned semi-final, Patong White and Kashmiri CC met in the morning to decide who would face Goan Panthers in the afternoon’s Grand Final. Kashmiri CC began the game with only seven players in awaiting the arrival of their skipper Iqbal Maliq, who eventually joined his team at the beginning of the 8th over, as Patong were pushing their score towards 60. It was a somewhat nervous start for Patong, issuing a new opening partnership of Michael Flowers and JG De Swart, with Flowers enjoying some good fortune, avoiding a duck in being dropped early in the first over, and presenting a further four catching opportunities throughout his day. 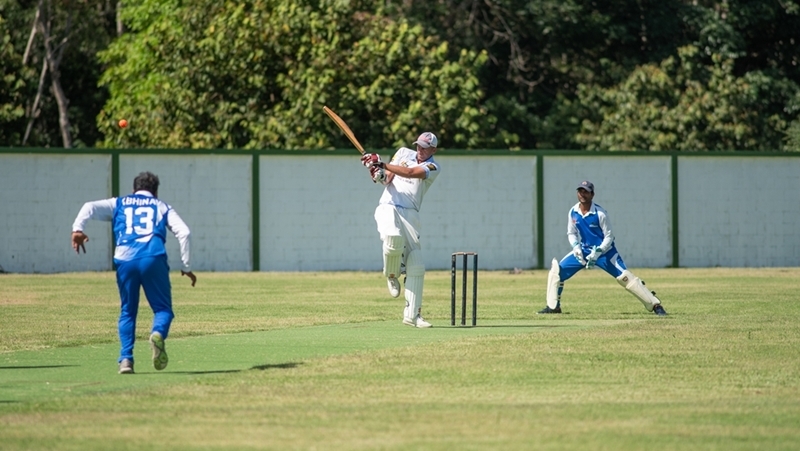 Despite the early chances put down by Kashmiri CC, Patong’s openers steadily grew in confidence even as they faced one of Phuket’s most feared pacemen in the form of Waseem Manzoor, with De Swart especially finding his range hitting 31 off 21 deliveries, before being bowled by Waseem in the sixth over. Stuart Hamilton and Flowers (13) pushed the score to 95 in the 10th over, when came the game’s first contentious issue, which saw Flowers’ demise following a looping full toss from Ahmed that dropped onto the batsman’s wicket at the same time as umpire Neil Quail called a no ball for a delivery above waist-height. A few moments of heated reflection ensued, with the decision reached that the batsman was indeed out. Following the 10-over break, Ike Bekker (1) and Tyler Whatley (9) both fell victim to run outs, before Patong captain, Anthony Van Blerk joined Hamilton with the score on 122. While Patong’s score edged towards 150 in the 17th over, Kashmiri’s captain Iqbal, who was also celebrating his birthday, took the ball for the first time in the game due to him missing the first eight overs – the rules only allowing a player to bowl once they have been on the pitch for the same amount of time as they were absent. An early birthday present for Iqbal came with his very first delivery in taking the wicket of Stuart Hamilton who was looking to extend a promising innings of 31, caught by Prasant and sending the Kashmiri side into rapturous celebration. But it was Iqbal’s next over that would have given his team belief that the game was theirs when he demolished Patong’s rear guard, taking just three deliveries in the 19th over to dismiss Van Blerk (12), then Shivam Bhattacharya (0) and finally Jason Robertson (5), in a devastating spell that concluded Patong’s scoring on 155 all out. Defending 155, Patong’s bowling and fielding needed to be at its best, and so it was leading into the third over with Kashmir’s score on just 12, when Khan was trapped LBW by Hamilton, before Arif Mushtaq was caught by Flowers off Bhattacharya’s bowling in the very next over, with Kashmir’s score on 24, quite a way off the required run rate. Unfortunately, a wayward over from De Swart boosted the Kashmiri tally and caused the pendulum to swing yet again back in their favor going into the second session. With Waseem and Prasant leading the charge, by the 14th over and the score on 108, the match was on a knife-edge, when Prasant (41) was caught by Hamilton off a delivery by Flowers. The next over brought with it the game’s big talking point and a scenario that could have irreparably turned the tide, when De Swart found a way past Waseem’s bat to hit the batsman square in front of the stumps, with Quail immediately raising his finger to the appeal for LBW, while Waseem’s disbelief erupted into a refusal to leave the pitch claiming the ball would have cleared the top of his wicket. But in yet another remarkable piece of sportsmanship from the Patong side, Van Blerk withdrew the appeal, allowing Waseem to continue. Taking full advantage of the clemency, Waseem let loose on Patong’s bowling in raging to a personal tally of 55 before he was undone by the pace of a revved-up Robertson and a superb low catch by Van Blerk behind the stumps with the score on 137. With Musa and Iqbal at the crease, Ahmed waiting in the wings, and 19 runs to win off three overs, the outcome still rested in Kashmir’s favour, but two quick wickets ending Musa and then Iqbal’s involvement in the game for the addition of 15 runs meant Ahmed was left alone to find four runs for victory as last man standing – a situation which requires the batsman to hit a minimum of two runs or a boundary for a score to be counted. Unfortunately for Ahmed, either in panic or not being made fully aware of the rules, he scampered through for a single in the 19th over allowing Bhattacharya to lob the ball back to Van Blerk to easily have the bewildered batsman run out at the opposite end… the error handing a dramatic four-run victory to Patong and a place in the Grand Final. Pick of Patong’s bowling was Bhattacharya with two wickets from his four-over spell for 18 runs, while Iqbal clearly took Kashmir’s bowler of the day with three wickets and a run out for seven runs off just two overs. Goan Panthers would have understandably fancied their chances against a weary Patong side, who were given just 30 minutes to prepare between their hard-fought semi-final and the start of the Grand Final, but two league losses against their Patong opponents earlier in the season would also have weighed on their minds going into the match. After winning the coin toss, Panthers decided to put Patong into bat, again with Flowers in the opening slot, while partnered by Van Blerk on this occasion. A patient start from the two batsmen saw Patong’s score on just 10 after four overs, but they soon opened up taking the total to 76 at the 10-over break. Fatigue was certainly evident in both Flowers and Van Blerk when play resumed, with communication and movement between the wickets somewhat strangled resulting in Van Blerk unable to get back to his crease at the end of the 11th over, being run out for a disciplined 31 runs. Flowers was then joined by Bekker, and the pair thrust the total to 120 in the 16th over when Pranesh Kinlekar ousted Flowers’ middle stump, but registering a top score of 45 for Patong’s methodical opening bat. The Panther’s final wicket came when Kinlekar struck once more three balls later as Hamilton tried to drive a ball off his toes only to see it deflect off his pads and onto his stumps with only one run to his name. Adam Drew (10) and Bekker (22) withstood the final four overs, taking Patong’s total to 154 off their 20 overs, with Panther’s opening bowlers Arun Virdikar and Ravi Naik outstanding in restricting Patong to just 31 runs off their combined 8-over spell. As the sun lowered over the ACG, Patong went into their bowling session, and it took only until the second over for Hamilton to impact the innings by teasing Naik out of his ground with a flighted delivery for Van Blerk to whip the bails off the floundering batsman’s wicket. Naik’s opening partner Mayur Denskar lasted just another four balls before Bhattacharya snared the batsman in front of his wicket with an unplayable delivery giving umpire John King a straightforward LBW decision. Grinding out the hard runs, Dessai and Vijay Salekneni raised the score to 32 before a refreshed Robertson upended Dessai’s wicket in the sixth over, bringing Virdikar to the crease for a quick eight runs off eight balls before he was given out caught behind attempting to cut a short delivery from Bekker and the Panthers on a total of 49 in the ninth over. Robertson was then to claim the scalp of Salekneni, caging the Panthers on 57 for 5 as the 10-over break approached. Given that Patong had taken five wickets in the first session, it seemed plausible that Panther’s tail-end would not hold out for long against the experienced Patong bowlers, but to their credit and especially due to a swashbuckling performance from Lucky Singh scoring 30 not out off 30 balls, assisted by Kinlekar (12 not out), Panthers played out their 20 overs losing only Abhinav Kalakar to a catch by Whattley for Robertson’s third wicket, eventually reaching a highly respectable total of 108 for 6. In the end though, it was a comprehensive victory for Patong White, and being justifiably crowned as champions not only in terms of competitiveness and effort, but also in how the team conducted themselves throughout the tournament in highlighting fair play in the spirit of cricket. Man of the Match was awarded to Michael Flowers for his efforts with the bat, while Mohammed Aa’rif from Kashmiri CC took home batsman of the series with an average of 108.7 from six innings. Bowler of the series went to Patong White’s inimitable Jason Robertson. Michael Flowers, also the PCG Chairman, thanked C&C Marine for their gracious support in sponsoring the league and further recognised the efforts of all the players, officials and committee members in bringing the league to a successful conclusion, while looking forward to next year’s league and increased participation. The Thalang Tigers Youth Cricket Academy has restarted for the 2018/2019 season, with coaching sessions at the ACG every Wednesday and Friday from 4:30pm to 6:30pm. Girls and boys of all ages are welcome to join for one or both sessions.